We strongly advise anyone to ignore these emails and block them, do not purchase anything from them. A search in Google for “DNSireland scam” reveals that many other’s are warning this looks like a complete scam! 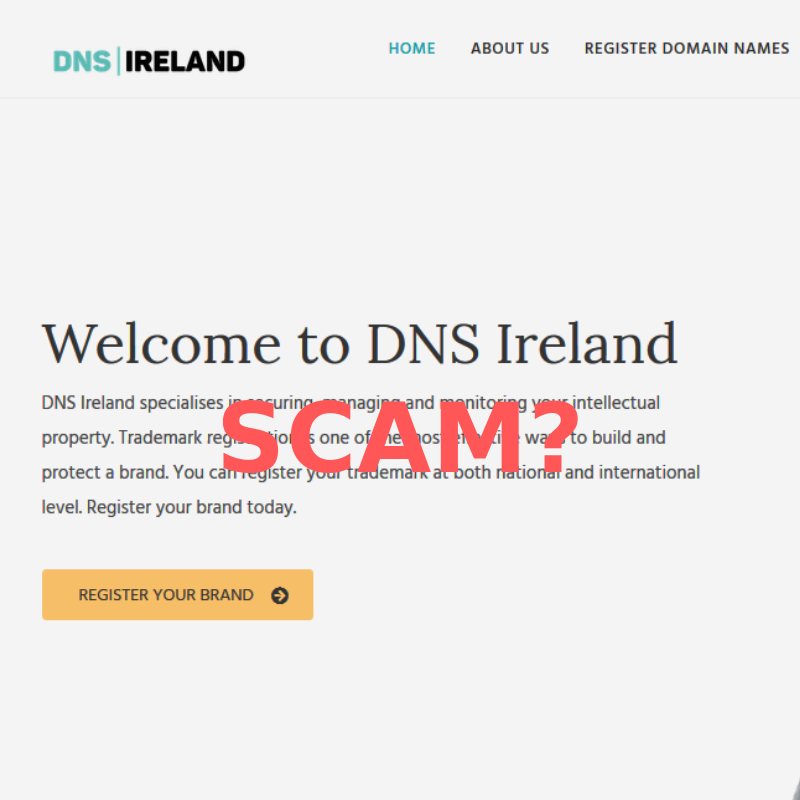 Spiral Hosting has today warned our Irish clients of a domain registration scam from dnsIreland.org. “The company claims to be “founded in 2009 in the heart of Dublin”, however their website domain was only registered in August 2018 and their directors are based in the Netherlands. So what does this email from DNSireland look like? The emails received are looking to sell you a domain name, similar to your existing .IE domain for a period of 10 years for € 199.50. Some of our customers contact us asking “should I be worried about this” because we would normally manage their domain name renewals. Another reason they are worried is because the language used within the emails (see below) is designed to make people concerned without any good reason, frankly, it’s a low-ball sales tactic. What’s worse though is DNSireland does not look anything like a real company from what other’s are saying. We are advising our clients to ignore these emails! In some cases it does make sense to purchase domain names similar to your existing business name so that you control any intellectual property associated with your business, to prevent someone else buying those domains. If you would like to register or research new domain names for your business then please get in touch info@osd.ie we can arrange everything for you and manage domain renewals. We are usually under the obligation to register the domain name and to protect it for a period of 10 years. The annual price for the .COM extension is € 19.95 per year. This means a one-off payment of € 199.50. When the link has been completed, all the Internet traffic that goes to the .COM extension, will be automatically linked to your current extension and website. This process will take a maximum of 24 hours. This domain name will then have a worldwide reach. The third party will be rejected and can no longer use your domain name. – You will receive a one-off invoice of € 199.50, exclusive of VAT, for a term of 10 years. OSD and Victor Leonard in particular are people that I am happy to recommend. We have used OSD to develop a market leading web solution that has not only differentiated us from our competitors but assisted us in entering export markets. This would not have been possible without OSD's support. They were professional, offered excellent value for money and flexible/helpful at all times. I would have no hesitation in using OSD for future projects.